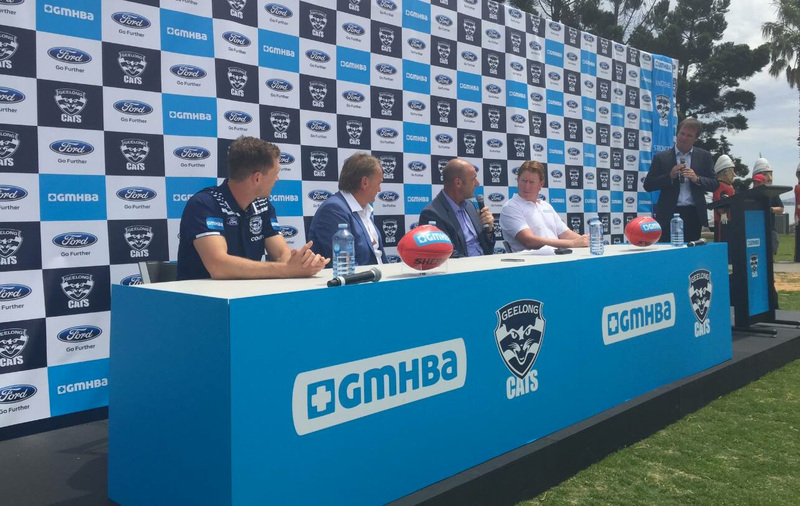 GEELONG has locked in its future, signing a 10-year deal with local health fund GMHBA that will see Simonds Stadium renamed from 2018. The Cats announced the agreement on Monday with the sponsor also appearing on players' shorts and the match ball during home games. CEO Brian Cook would not reveal the financial details but said it was the biggest deal the Cats had done in his time at the club. "We both see an amazing future together," Cook said. The Cats are undergoing an enormous transition through eras, with redevelopment of the stadium expected to be completed in May and the club hopeful of becoming debt free in the near future due to donations from wealthy backers. The stadium, which includes a state of the art football department, is now under the management of a recently installed Kardinia Park Trust. With the sponsor on board, the NAB AFL Trade Period done and the NAB AFL Draft on Friday, skipper Joel Selwood said it was time to look forward after the Cats had a disappointing end to 2016 when they crashed out of the preliminary final in a 37-point loss to the Sydney Swans. "We all felt it, the players, the coaches and even the community," Selwood said. "We thought we let each other down [so we're] trying to pick ourselves up, dust ourselves off and get to work." The Cats lost Josh Caddy to Richmond in the trade period but brought in former Carlton defender Zac Touhy and ex-Kangaroos forward Aaron Black. They also have picks 24, 38, 42, 63 and 71 in the draft. Selwood said he would miss playing alongside champion duo Jimmy Bartel and Corey Enright after both retired at the end of the season, but those returning to the club had him excited. He singled out the return of Jackson Thurlow, who missed last season due to a knee reconstruction, as a bonus. He also said the trade period was productive without being as headline grabbing as last year. "We had to work around and make sure we put our puzzle together this year," Selwood said. The 28-year-old enters his 11th year at the club over the foot injury that interrupted his pre-season last year. He officially returns to training on December 5 with the first-to-fourth-year players starting on Monday. Despite putting in an outstanding season alongside Brownlow medallist Patrick Dangerfield, he is putting the heat on himself as much as anyone to provide the improvement needed to go better than a preliminary final loss. "We can do more and they can more," Selwood said. Geelong plays its first home game on Friday May 19 under lights against premiers the Western Bulldogs.